When anyone shouts a single word hard and loud (although that one word can be shouted more than once), for various reasons, as long as the reason is other than actually needing to shout. If someone is shouting because of a noisy room, someone is far away, or that someone is barking out orders, it doesn't count. If the word is someone's name, this often takes the form of a Skyward Scream. If any other word is included, even if it's not shouted, it doesn't count as this trope. A Sub-Trope of Chewing the Scenery. Compare GASP, Say My Name, Calling Your Attacks, Metal Scream, Death Wail, Big "OMG! ", Big "SHUT UP! ", Punctuated! For! Emphasis! (those three would be sub tropes, but use more than one word). Kiai is a variant of this, when used as Kung-Foley. Not to be confused with Big Words. "SUUUURGE!" from one of Coca-Cola's attempts to enter the citrus soda market dominated by Mountain Dew. "SEGA! ": The Sega Scream from North American commercials for the Sega Genesis and its add-ons, the Sega CD and 32X. Some commercials for Genesis ports of third party games used the scream. Used in-game in at least one title: Sonic 3D Blast. "SE-GAAAAA! ": While best known in North America for it's use in Sonic the Hedgehog 1, 2, and 3 (and Knuckles), this jingle was used in Japanese commercials for all of Sega's console offerings from the SG-1000, to the Sega Saturn (when it was replaced by the "Segata Sanshiro" campaign). "HARRISON! ": from a 2009 advert for Specsavers. "(It's) BACON!!! "note "Beggin Strips from Purina: Dogs don't know it's not bacon ('It's BACON!!!').". "RAID?!!!" ([Boom! ])note Raid pest control products: they kill bugs...DEAD! Lisa: Dad says if you make us scream, you're dead meat. Lisa: (takes deep breath) DAAAAAAD! !note Bart then puts a piece of Butterfinger in Lisa's mouth. Used many times in Soul Eater, with many contributions by none other than the resident ham, Black* Star. Also on a similar note "FOOL"
"BAAAAAN... KAI!" from Bleach. Japanese for "Final Release". Magical Girl Lyrical Nanoha Strikers: TEEEEEEAAAAAAAAAA!!! A few times in Dragon Ball Z. Example: after being beaten by the Androids, Arrogant Kung-Fu Guy Vegeta vents his frustration by shouting "KUSOOOOOOOO!" ("SHIIIIIIIIT!") so loudly it crumbles the mountain he's standing on. At the 23rd World Martial Arts Tournament, when Goku doesn't recognize Chichi she suddenly gets really mad and yells BAKA/FOOL! so loud everyone in the room falls over. This is a trope that's not so unusual in anime, with two characters shouting their names back and forth. InuYasha and at least one .hack series do it often, for example. Mobile Suit Gundam 0083: Stardust Memory: "GATOOOOOOOOOOOOOOOOOOOOOOOOOO!!!" "Karyuu no...HOUKOOOOOOOOU!" and all variations thereupon. The English equivalent: "Fire Dragon...ROOOOOOOOOOOOOOOOOAR!" MOETE KITAAAAAAAAAA!!!! !note Normally, he just says "Moete kita zo!" Gigantor: GIGANTOOOOOOOOOR!! GIGANTOOOOOOOOOR!! GIGAAAAAAAAAAAAAAAAAAAAAAAAAAANNTOOOOOOOOOOOOOOOOOOR!!! Not done in the Japanese theme, however. Fuh-RED!note This does not happen in the Japanese original, where he is known as "Shogun Tokugawa". TEYANDEE!note Based on the show's original Japanese name "Kyatto Ninden Teyandee"; a Catchphrase of sorts used by Yattaro (or "Speedy Cerviche", as he's known in the show's previously mentioned Gag Dub). The Pokémon Speak from the Trope Namer is occasionally done this way. The late, great country comedienne Minnie Pearl: "HOWDYYYYYYYYYYYYYYYY!!!! "note "I'm just so proud to be here!" Superman: For the Man Who Has Everything: "MONGUL!" GARFIELD: John would often shout "GARFIELD!" Axis Powers Hetalia fanfic Gankona, Unnachgiebig, Unità : After Germany pulled out a Browning Hi Power on Japan and Japan pulled out his katana on Germany, Italy screamed one word for them to stop. In chapter 82 of Mario and Sonic: Heroes Unite!, as Bowser is delivering the smackdown to Metal Sonic, Bowser Jr. suddenly yells at him to stop. In an Omake chapter of the first story in Noir Ange, also known as My Destiny My Fervent Plea one of the main characters gets a little too hyper: "CUUUUUUU- UUUUUUUUUUUU - UUUUUUUUUUU- UUUUUUUUUUUUU- UUUUUUUUUU- UUUUUUUUUUU- UUUUUUU- UUUUUUUUUUU-UUUUUUUUU- UUUUUUUUUU- UUUUUUUUUUUUU- UUUUUUU- UUUUUUUTE!" (500) Days of Summer: "PEEENIS!" "KHAAAAAAAN!" So big, it bounces off the edge of the universe to echo in outer space. People fail to realize that Kirk is intentionally over-doing it to trick Khan. It's revealed later that he has an escape plan. Given an homage in Star Trek Into Darkness by Spock when Kirk gets a Disney Death. Spoofed on The Big Bang Theory as "WHEATON!" The Rocky Horror Picture Show: "BRAD?!" "JANET?!" Scent of a Woman: "Hoo-ah!" 2001: A Space Odyssey: "HAL!" Flash Gordon: "(Oh well, who wants to live forever?) DIIIIIIIIIVE!" The Curse of the Black Pearl: "DOWWWWN!" Dead Man's Chest: Jack ¡¡¡SPARROW!!! Monty Python and the Holy Grail: "NI!" Pink Floyd: The Wall: "STOOOOOOOOOOOOOOOOOOOOOOP!!!" Teenage Mutant Ninja Turtles (1990): "DAAAAAAAAAAAAAMN!" In The Wizard when Putnam finally catches up to Jimmy, Corey, and Haley while they are in Las Vegas: "HALEEEEEEEEEEEEEYYYY!!" Taken Up to Eleven in the live action Popeye movie, courtesy of Bluto: "OOOOOOOOLIIIIIIIIIIIIIIIIIIIIIIIIIIIIIIIIIIIIIIIIIIIIIIIIIIIIIIIIIVE!!!!!!!!!!!!!!!!!!" "HAJIME!! "note Actual Japanese word, meaning "begin". Afterwards, Funny Bruce Lee Noises can be heard. (A) MAAAAAAAAAAANNNNNNNNNNN!!!!!!!!!!!!!!!!! !note "Yoo-hoo, lover boy! It's Lena Hyena!" Jessica: (Oh...my...God..., it's) DIIIIIIIIIIP!!! !note Judge Doom: That's right, my dear! Enough to dip Toontown off the face of the Earth! The Force Awakens: "TRAITOR!!!" Not once, but twice. The Great Muppet Caper: "(Ah, Miss Piggy, It's you! It's YOU! It's) YOOOOOOOOOOUUUUUUUUUU!!!!!" Done in every one of the Pigeon books, big enough to fill a double-page spread. Cinderella: CINDERELLA! !note In some versions of the story, anyway. Bill Nye the Science Guy: SCIENCE! Dave Chappelle's impression of Lil Jon featured YEEAAAH!, WHAT? !, and OKAAYYY! "GERONIMOOOOOOOOOOO!!!" note The Eleventh Doctor's favoured catchphrase. "KIDNEYS! "note "I've got new kidneys! I don't like the colour." "Of your kidneys?" Harry Hill's TV Burp: "SALMOOOOOOOOON!" Ursula "Araña" (or rather, "Arana") from the Mexican telenovela María Belén: ¡¡BELEEEEEEEEEEEEEEEEEEEEEEEEEN!! Monty Python's Flying Circus: "SPAM!" "Ker-MIT! "note Mainly said by Fozzie Bear. Anything Animal says.note AN-Y-THING!! AN-Y-THING!! Never Mind the Buzzcocks: "BARROWMANNNNNNN!" Our Miss Brooks: "Now GO! ", Mr. Conklin's favored expression when ordering someone out of his office. Sesame Street: "(ME LOVE) COOKIIIIIEEEEE!" That Mitchell and Webb Look: "HENNIMOOOOOORE!" You Bet Your Life: (And now here he is, the one, the only...) "GROUCHO!" (And I say) HEY-EY-EY-EYYYY! HEY-EY-EYYYY!note "I say HEY! What's going on?" Underground Metal (death, black, etc), and sometimes even mainstream genres (e.g., "hair" metal) will often have this at some point. "Hit and Run" by Loletta Holloway: "When it comes to... LOOOOOOOOOOOOOOOOOOOOOOOOOOOOOOOOOOOOOOVE!" This also often occurs in classical opera. "If our love's insanity, why are you my clarity?" Eric Clapton: LAY-LA!note "You got me on my knees! LAYLA! I'm beggin' darling please", etc. This happens in the original version, but not the Unplugged Version. "RE-MIX!! "note This sometimes happens in (especially) hip-hop remixes. Tears for Fears: SHOUT! SHOUT! note "Let it all out! These are the things I can do without, come on! I'm talking to you, come on!" George Michael combines this with Rule of Three on his solo Protest Song Freedom '90.note Back when WHAM! was still together, they had recorded a completely different song called "Freedom". "FREEDOM! FREEDOM! FREEDOM! "note "You got to give for what you take!" Carly Simon: Anticipation!note "Anticipa-a-tion is makin' me wait! "; also an advertising example, due to being a Repurposed Pop Song way back in the 1970s, when it was used in a series of commercials for Heinz ketchup. Snoop Dogg:note Back when he was known as "Snoop Doggy Dogg". "MURDER! "note "Murder was the case that they gave me!" This was the Title Theme Tune to a short film he made called "Murder was the Case". At the time, Snoop Dogg (real name: Calvin Broadus Jr.) was suspected of having committed murder. In The Machine: Bride of Pin*Bot, one of the astronauts shouts "YAHOO!" whenever you make the 200,000 point Skill Shot. Creature from the Black Lagoon: "FOCUS!" No Good Gofers: RIPOFF!note This is a multiball mode that has an add-a-ball feature. CM Punk wants to remind all the Full Impact Pro fans listening that you are a WHOOOOORE! Ricardo Rodriguez is pleased to introduce Albertooooooooooooooooooooooooooo[...]ooooo, DEL RIO! How do you know Christian will be at a WWE show or not? You hear a booming "GO!" "Ladies and gentlemen, here is your winnernote And STILL WWE (World Heavyweight) Champion: JOOOOOOOOOOOOOOOOOOOOOOOOOOOOOOOOOOOOOOOOOHHHHHHHHHHHHHHHHHHHHHHHHHHHHHHNNNNNNNNNN CEEEEEEEEEEEEEEEEEEEEEEEEEEEEEEEEEEEEEEEEEEEEEENAAAAAAAAAAAAAAAAAAAAAAAAAAAAAAAAAAA!!!!!!!!!!!!!!!!!!!!!!!!!" Spanish (and Brazilian Portuguese)-speaking football sportscasters: "¡¡¡GOOOOOOOOOOOOOOOOOOOOOOOOOOOOOOOOOOOOOOOOOOOOOOOLLLLLLLLLLLL!!!" Italian sportscaster Tiziano Crudeli: PIPPOOOOOOOOOOOOO! !note Just one part of his (onscreen) freak-out when Filippo Inzaghi (AKA: "Pippo") scored the winning goal for AC Milan in the last game of his career. Murray Walker's BBC commentary on Formula One: "And it's...GO GO GO GO GO!" An old golf expression: "FORE!" "FOUL! "note Although, usually it's "foul ball!". "BALK! "note A balk is an incomplete pitch, which doesn't happen very often, especially in Major League Baseball. "CHANGE! "note This is when the umpire calls for the teams to change sides after three outs, although most of the time, the players don't need to be told, which, again, especially applies to MLB. American Football players will often do several of these in a row when calling out signals. In Bells Are Ringing, when Jeff realizes that "Melisande Scott" is the same person who answers his calls at Susanswerphone, he shouts the only other name he knows her by: "MOOOOOOOOOOM!!!" In Leonard Bernstein's Mass, the Celebrant interrupts "Dona Nobis Pacem" by shouting "PA-CEM! PACEM! PAAAAAAAAAAA-CEM!" and shattering the holy vessels. A Streetcar Named Desire: "STELLLLLAAAAAA!!!" Oliver: Please sir, I want some...more? The Barber of Seville: FIGARO!note "Figaro! Figaro, Figaro, Figaro, Figaro, FigaroFigaroFigaroFigaro...", etc. The earliest "talking" dolls did this ("MA-MA!"). "Snake? What happened? Snake? SNAAAAAAAKE!!!" Tales of the Abyss: "REPLICAAAAA!" "TEEEEERIAAAAAAAAAAAAAAAAAAAAAAAAAAAAAAAAAA! "note This only applies to the Japanese version, however, as the yell is much shorter in the English dub. In Commander Keen Episode 1, most of the small levels have a Yorp statue near the exit bearing a telepathic hint. One level has a Garg statue instead, which says only "GAAARRRRRGG!" Portal 2: "Space? Space! SPAAAAAAAAAAAAAAAAAAAAAACE!" In Max Payne 3: "GOD DAMMIT!" "GESPENSTO KIIIIIIIIIICKU! ", and any variation thereof (including Rätsel referencing "UNIVAAAAARSU!" from Turn a Gundam). The loudest such scream belongs to Kyosuke Nanbu, played by famous mic-breaker Toshiyuki Morikawa. Almost every pilot in the franchise screams louder than a foghorn when given the chance. Knowing the genre, this isn't really surprising. In Hyperdimension Neptunia, firing as Compa will sometimes prompt her to yell, "SHOOOOOOOOOOOOT!" In Hyperdimension Neptunia mk2, performing Nepgear's Slash Wave attack will result in her shouting, "GOOOOOOOOOOOOOOOOOO!" "SALAZAAAAAAAAAAAAAAAAAARRRRRRRR!! "note It's unclear whether or not the second a is actually there. That is, it may be "Salzar", rather than "Salazar". "KAMPFSTIEFEL!!! "note Literally, "combat boots"; and this is in a series where the non-American (or Canadian) characters are supposed to be actually speaking surprisingly good versions of their native languages. To Von Kaiser's credit though, he does speak "Surprisingly Good German" most of the time. The 1986 arcade game Genpei Touma Den has "BAka mé!" ("You fool!") spoken by Benkei when Kagekiyo has to fight him. Ratchet & Clank series: "LAWRENCE!!!" Rodea: The Sky Soldier: CECILIA! !note "PAPA DA YO!!" At least one Older Than They Think example happens in the NES game Wild Gunman: "FIRE!" Tomodachi Life: "YUUUUUUUUUUUMMMMMMMM!!!!!!! "note When a Mii eats its super all-time favorite food. Dragon's Lair II: Time Warp: DIIIIIIRK!!! (Kidnapped?! My Daphne kidnapped again?!!) IDIOT!!! DUMMKOPF!!! !note "YOU...BETTER...FIND...MY...DAUGHTER...ORRRR...EEEEEELSE!!!!!! COWARD!! ", etc. Psycho Soldier:note Along with Genpei Toumaden, it's one of the earliest arcade games to feature voice acting (i.e., by actual people, and not synthetic voice actors). It even has a vocal theme song. CHEN-JI!note "Change" in Gratuitous English. The English version has her say "Watch me change!" RAKKII!note "Lucky". In the English version, she says "I'm lucky!" Tetris Attack: Nintendo!note This was also done in the original Panel de Pon!. Wario: Nintendo! Heh, heh, heh, heh, heh, heh, heh! Waluigi: Camelot!note The company that developed the game. Heh-heh-heh! Yoshi's Story NINtendo!note The Japanese pronounciation of the company's name, as given by Kazumi Totaka (the voice of Yoshi, beginning with this game). Super Smash Bros games since Melee: Game! Time!note In the previous game, it was "Game Set" and "Time Up", which are still used in the Japanese versions (including Melee when it's set to Japanese mode in the North American release). 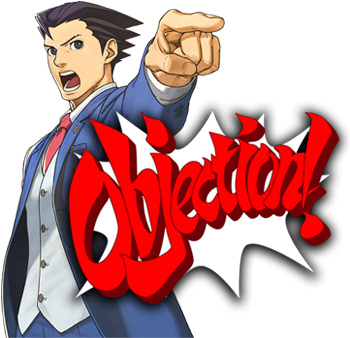 Very, very frequent: "OBJECTION!" "GOTCHA!" "EUREKA!" "SILENCE!" The series also has various other moments were a word is shouted out, a lot of the time in captials with multiple exclamation points and even a lot of the time drawn out. "WHAAAAT?!" is pretty common, as is "N-NOOOOOOOOO!!". In Dual Destinies even Edgeworth does one of these, when Phoenix proves that the true murderer posed as the victim whom they had just killed. Irregular Webcomic! : "KIIIIIIRRRRRRKKK!!!". And it links to this very page! Harry Potter Comics: Ron's reaction to finding out his daughter is in "HUFFLEPUFF!!!!!" Yu-Gi-Oh! The Abridged Series: "KROOOOOOOOOOOZE!!" When co-reviewing Sucker Punch with JesuOtaku, "FEMINISM!!1!OMGBRILLIANT!11!!" Other reviewers have tried to use the phrase. When reviewing Nukie, The Cinema Snob tried to get Mat to do the bit, but it was early in the morning and Mat had a funeral to go to. He ends up doing a half-hearted version of his own. The Nostalgia Critic ends up destroying all of Chicago during his review of Quest for Camelot. He keeps demanding that the movie explain what is going on ("EXPLAIN MOVIE! EXPLAIN!") until his frustration finally erupted in an actual atomic explosion. Critic: * Leans back in his chair and breathes a sigh of relief, before doing a Double Take as he looks outside to see a leveled city and emergency response teams running around. * "Er..... Sorry." Whenever he begins his Christmas themed episodes he shouts "Chrisma-a-a-s!!" followed by a mantra of that word while decorating his set. This anguished review of Boku No Pico: "YOOOOOOOOOOOOOOOOOOOOOO!!!!!!!!!!" Censored but still NSFW. Nothing will stop Captain Hammer from finishing his villainous Hero Song. "WAAAAAAAAAAAAAY!!!" 90s Kid ended a sentence with one. He also usually introduces himself with "DUUUUDE!" "And one of them has the greatest superpower of all, GUUUUUUNS!" The beginning of the: "Adventures of the Kool-Aid Man" review. Linkara: WHY?! Why make a comic about the Kool-Aid Man?! CollegeHumor created "Powerthirst," a spoof advertisement for a made-up energy drink. About half of the runtime of the video (and of the sequel) involves a man with steroids in his voice shouting random catchwords like a drill sergeant. Two Best Friends Play: "AMMMMEERRRRIIIICCAAAAAAAA!!!!" The Runaway Guys —specifically ProtonJon— give us "GAAAAAME!" Analyst Bronies React: When Everfree used the word "reputation", after all the uses in Friendship Games, Thespio gleefully shouts the word again. IT'S TIME FOR YOU TO GET A DAMN WAAAAAAAAAAAAAAAAAAAAAAAAAAAAAAAAAAAAAAAAAAAAAAAAAAAAAAAAAAAAAAAAAAAAAAATCH! (beat) Dickhead! The Jetsons: "JETSOOOOOOON!" And in Jetsons: The Movie: "GERTRUDE!" The Hunchback of Notre Dame: "SANCTUARYYYYY!!!" "BARRRRRRTTTTTT!!! "note Usually done by Homer, but also done on at least one occasion by Lisa (in the Thanksgiving episode). Batman: The Animated Series: "HARLLLLLLLEEEEEEYYYYY!!!" Avatar: The Last Airbender: "HONOOOORRRRRRRR!!!" The show seems to have a thing for ponies dramatically shouting "FOREVER!" It's been done by Nightmare Moon, Pinkie Pie, Princess Luna, Rainbow Dash, and Doughnut Joe. In "Castle Mane-ia", Twilight shouts "Stop!" as her friends are aimlessly panicking about nothing, punctuated by a spell that freezes them all in place. Ed, Edd n Eddy: "BIG TROUBLLLLLLLLLLLLLLLLEEEEEE!!!!!!" Aside from the expected Metal Scream, Metalocalypse featured Doctor Rockzo the Rock n' Roll clown's Catch-Phrase of "I do COCAINE!" Invader Zim is full of this, not surprising as it's set in a universe of hamnote AND VOMIT! What's Opera Doc? : "SMOOOOOOOG!! "note This line was done by Mel Blanc when it was decided that Arthur Q. Bryan's voice wasn't strong enough for what they wanted. At least one Merrie Melodies short has a mother rabbit doing this to her son, "PETER!!". Super Mario World: "Mario, wherever you are, HEEEEEEEEEEEEEEEEEEEEEEEEEEEEELP!" The Rugrats Movie: "Nice try babies, now give me back my...*GASP*...CYNTHIAAAAAAAAAAAAAAAAAAAAAAAAAAAA!!!!!!" Rugrats in Paris: "KIRAAAAAAAA! "note "Madame La Bouche wants her Pickles, NOW!" ''The Ren & Stimpy Show: A-TEEEEEEEEEEEEEEEEEEEEEEENNNNNNNNNNNNNN-HOOOOOOOOOOOOOOOOOOOOOOOOOT!!!!!!!!!! "TIMMY! "note Done at least once by his parents in the episode where he's accused of shoplifting. Futurama: *deep breath* "DOOOOOOOOOOOOOOOOOOOOOOOOOOOOOOOOOOOOOOOO--" The scene cuts away before Bender can complete his "DOOMED!" The Angry Beavers" "THROOOOOOOOAAAAAT!" note Daggett about to get revenge on Bill Licking for making an embarrassing nature documentary of him and Norbert. Norbert stops him, though. The Secret Of Nimh: "BRIS-BY!! "note "Oh, Auntie Shrew." "Oh, Auntie!" "Oh, no!" Teenage Mutant Ninja Turtles: "COWABUNGA!" "I told you, Mikey! No more cowabunga!" Ebenezer Scrooge: I'll change! I'll CHAAAAAANGE!!! Tom and Jerry: THOMAS!note Often said by Mammy Two-Shoes after she catches him doing something bad (or simply thinks he is). The classic Disney short Figaro and Cleo: FIGARO!note Said by a similar character, referred to on the Disney Wikia as "Old Aunt Delilah". Angela: KETCHUUUUUUUUUU...note Nanette: Excuse-moi? / Angela: AAAHHH... / Johnny: AAAHHH... / Gina: AAAHHH... / Gordy: AAAHHH... / Nanette: How immature! White Diamond: What is this? Where is Pink? White Diamond: What did you say? Answer me! Any First Name Ultimatum can take this form when a parent is especially angry at their son/daughter. Whether literally, or figuratively, anyone living in (especially extreme) poverty will likely be saying this at some point: "FOOD!" This is the whole point of "kakegoe" in Japanese festivals, with words such as "sore!" and "yoisho!". These are also often heard in Ondo songs as well.note They have also been done as "ah sore!" and "ah yoisho!". Any time a lumberjack cuts down a tree: "TIMBER!"